The call from the club before the game was to evacuate Chorley and there certainly would not have been many locals pounding the streets of Market Walk at 3pm on Saturday as nearly 2,000 fans watched the Magpies agonisingly fall at the final hurdle as they lost to FC Halifax in extra time. Chorley’s bid to end a 27 year absence from the National League ended in cruel fashion at the Shay as gardener Scott Garner dug-up all of the fine seeds Matt Jansen’s blossoming Magpies side had sown in an impressive season with one late header in a thriller in front of the league’s record ever play-off final attendance of just under 8,000 on Halifax’s home pitch. The flares and strobe lights in a section of the home support before kick-off anticipated a bright start to proceedings but rather than an electric start the packed crowd had to wait an extra 15 minutes for kick-off due to roadworks outside the ground. Like the traffic around Halifax’s home fortress it was a slow but a fiery start at the Shay. Tackles flew in early doors with the recalled Jack Sampson, who’s three match ban for final conduct saw him eligible for this final clash, catching Halifax’s Wilde with a late challenge. He just escaped unpunished but it set a precedence of leniency on the biggest day of the season from referee Daniel Middleton who could have brandished a stronger colour than the yellows he littered around the pitch as the game wore on. Chorley’s defence was titanic with talismanic skipper Andy Teague roaring the Magpies on with some fine defensive blocks and headers on top of some slick attacking play. Matt Challoner also impressed and it was the defender who was on hand to nip in at the back stick ahead of Halifax’s on-loan Fleetwood development squad player Dion Charles to snuff out a rare attack in the opening 30 minutes as the game began to open up and become a thrilling end-to-end contest. Chorley striker Marcus Carver was denied the chance to play-on by the referee as he was ruled to have impeded Sam Johnson before the Halifax shot-stopper gifted the ball back to him. Chorley were in the ascendancy but could not find a ruthless touch and they nearly paid the price as the ball pinged around their box but fortunately Garner fired straight at Branagan. Josh O’Keefe saw a first time effort drop to safety as the final 10 minutes of the first-half became an end-to-end affair as Sampson somehow failed to connect in the six-yard box after a Halifax defender nodded the ball straight into his path. Charles’ neat footwork on the edge of the box saw David Lynch pounce but his effort just flew over the bar. Chorley lost ex-Manchester City defender Stephen Jordan to injury in a half that saw the hosts lose Wilde after he could not play on from that earlier Sampson foul. There was controversy once again as the lively Matty Kosylo appeared to react to Adam Blakeman but he escaped with just a yellow card for his reaction. As the half drew to a close Sampson managed to find some space at the top of the box but Johnson was on hand to collect. But after Chorley were rampant in the first half Halifax were clinical just seconds into the new half. Roberts outpaced Blakeman on the right of the box to sprint one-on-one and drill the ball through Branagan’s legs just a minute into the second half. It was a big blow for Chorley after all the hard work but they showed their fighting mentality as they battled back. They stormed up the other end and some good work by Sampson saw them win a corner but Halifax should have put the game to bed from the subsequent corner. With the Magpies desperate to get back into it they piled bodies forward for the set-piece but once a tame delivery was cleared the hosts countered with Kosylo eventually sprinting into space on the left but he lost his composure and blasted over. Jansen sent on striker Jason Walker and went three up front and the fresh legs buoyed Chorley’s confidence with Blakeman - who was determined to make up for his earlier error - winning and subsequently firing in a set-piece from just outside the box moment after Walker’s introduction. It was a fine left-footed strike that saw wild celebrations from the 1941 travelling Chorley fans. The Magpies escaped unscathed from a goalmouth scramble that just saw skipper Teague and Branagan combine to stop a host of blue shirts before Carver was hurt up the other end in an aerial challenge. That foul paled in comparison to the next with Leather having to have his head bandaged after what looked like an elbow from Halifax striker Denton on the defender. Tempers were boiling over but the referee just brandished a yellow despite Leather’s blooded head as the game descended into a bad tempered affair. But Chorley continued their hunt for a winner as Teague was on hand to head the ball into a dangerous position after Johnson flapped at thin air but Carver at the back stick was less than clinical and put the ball wide when all he needed to do was hit the target. Walker nodded straight at Johnson as the Magpies continued to create the best chances at the close but neither side could find a winner and the tie went to extra time. Halifax had the first chance as Denton rose above the pack to nod the ball wide, Whitham’s deflected header went just over up the other end but it was to be Halifax’s day on their own turf. Whitham fouled just outside the box, Branagan managed to bat away Sinnott’s curling effort but it was Chorley’s inability to clear the subsequent corner that lead to Halifax netting the winner as Garner nodded home a re-worked cross from the right. 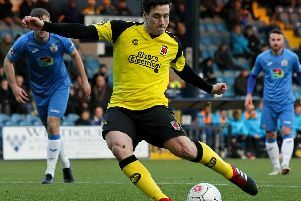 Chorley continued to show that fighting spirit that has summed up their season as they aimed to become one of the first teams to finish sixth and still gain promotion after fifth-placed Darlington were unable to participate due to failing ground grading regulation requirements. Kosylo had two more efforts on the counter but his first was deflected away and his second hoofed over after another scramble in the box. Chorley kept knocking and it was keeper Branagan who had their best chance in the dying embers, a corner from the right fell to the fushia-shirted shot-stopper in the box but he could not leave his opposite number red-faced as his fierce volley just flew over the bar. It was a mammoth effort from both the players and the fans but unfortunately it just was not to be and Chorley will have to wait another year for a shot at a return to the National League. Halifax: Johnson, Roberts, Garner, Hotte, Brown, Wilde (Denton 24), Kosylo, Lynch (Clarke 79), Sinnott, Charles (Moyo 63), Peniket. Subs not used: Drench, Morgan. Chorley: Branagan, Challoner, Leather, Teague, Jordan (Charnock 38), O’Keefe (Walker 58), Whitham (Roscoe 105), Blakeman, Cottrell, Carver, Sampson. Subs not used: Jarvis, Beesley.